This past spring, my dear friends Karen Paige and Andrew Dornenburg recommended that we go to a neighborhood trattoria Bellavitae to have, among other things, chef-owner Jon Mudder's pesto which he made to order at the bar in an actual marble mortar. We visited Bella Vitae on Mother's Day and loved the food but it was too early for pesto. I anxiously awaited the start of the fresh basil season and returned to be rewarded by a most exceptional pasta and pesto. Jon revealed it's secret: He imported the basil from Israel! He explained that the Israeli basil was more tender than the basil commonly available here. 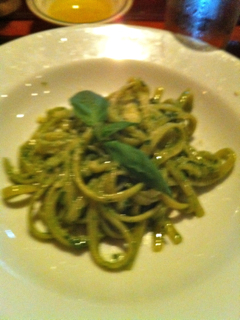 The result was a pesto that seemed to melt on the tongue. The pasta had just the right firmness and sure enough it turned out that Jon was using my favorite and most expensive Latini pasta. Can you imagine the cost for these ingredients! Could this be why the wonderful restaurant, joyfully and recently discovered by me closed a few weeks after my third visit? Hopefully Jon will open a restaurant again soon but in the meantime you can visit him on his highly rated blog. Here's the link. Place the nuts in processor container and pulse until coarsely chopped. Remove the nuts to a bowl and set aside. Place the basil in a food processor and process until coarsely chopped, stirring down the leaves from time to time. Add garlic and process a few seconds until evenly mixed into the basil. Add oil and seasonings and process only until mixed. Add the Parmesan and nuts and pulse just until uniform.